HFB loves his rice dumplings and he is pretty certain this restaurant promotion at Jiang-Nan Chun will satisfy his cravings as much as it will satisfy yours. In commemoration of the Dragon Boat Festival, home‐made dumplings generously filled with savoury and sweet ingredients debut at Jiang-Nan Chun, June 1 till 23, 2012. Guests may choose to order a single dumpling or a selection to be enjoyed with their dining companions. Served piping hot, the steamed glutinous dumpling filled with mushrooms, conpoy, lotus seeds and chicken ushers in the meal on a savoury note. For a taste of Chef Alan Chan’s signature X.O. sauce, the steamed dumpling featuring dried shrimps prepared in this sauce will satisfy palates relishing a hint of spice. 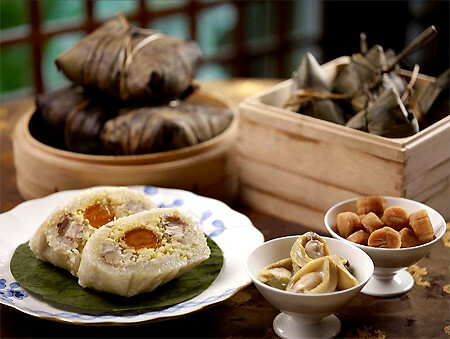 A nourishing addition to the menu is the steamed dumpling filled with bird’s nest, while those who prefer a sweet option will favour the steamed dumpling filled with red bean paste. Just as highly starred on the menu is the steamed dumpling stuffed with snow lotus, conpoy, pork, salted egg yolk, mushrooms, lotus seeds, green beans and chestnuts. In addition to the a la carte menu of steamed dumplings, diners may gather over a five‐course set lunch menu priced from $58 per person. At dinner time, a six‐course menu highlighting deep‐fried soft shell crab, sautéed lobster with egg white and crispy conpoy, and braised chicken with abalone and black mushrooms; to name a few, is priced from $88 per person. All prices are subject to 10 percent service charge and prevailing taxes.